After last week’s break away from personal finance books it was time to get back on that horse and I couldn’t have picked a better book. Farnoosh Torabi’s latest book Psych Yourself Rich fit the bill. The book is directed towards young adults but even this old dog learned something. First of all, the author is impressive! She starred in the reality show “Bank of Mom and Dad” and was a senior correspondent and host on “Wall Street Confidential”. This is in addition to authoring a previous book, many magazine articles and numerous appearances on news shows as a financial expert. The content is organized into three parts with 10 chapters total in addition to the introduction. It is a fast interesting read even at 204 pages. There are lots of resources, facts and quotes that moves it along. You know it’s interesting when an author quotes Chris Rock and Socrates! Set goals that are specific and actionable and make sure they’re diversified. Remember to focus on all aspects of life. It’s important to be organized. How could you be rich if you don’t even know how much you owe? Another key point in this part is to be your own advocate. I could have used this advice 20 years ago. No one is going to look out for you and your money like you! The most important point is to create a 5 year plan. This doesn’t mean you can’t change the plan based on changing circumstances. Use physical tools such as a vision board to keep these goals in mind. Having your ducks in a row allows one to go outside the comfort zone with risk. This might be investing in something new (although I disagree with the author regarding gold) or starting your own business. There are several examples of people turning their passion into part-time or full time opportunities. 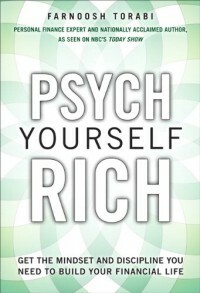 I’m happy to be able to give a copy of “Psych Yourself Rich” to a reader. There are four ways to enter the giveaway. For each entry, leave a separate comment. 2. SUBSCRIBE: Subscribe to Buck$ome Boomer and leave a comment saying if it is via RSS or email. 3. TWITTER: Tweet the giveaway and leave a comment letting me know. 4. BLOG: Include the giveaway in a post on your blog linking to this article and leave a comment. This giveaway is open to those 18 or older and U.S. residents only. Entries close on November 23rd at noon Pacific Time and the winner will be selected via And the Winner Is… plugin. If there is not a response within 48 hours to request for mailing address another winner will be selected. Remember to leave an email address that you’ll be checking. Looks like a good book! I work in finance, so I am always looking for fun ways to make it more accessible! I’l love to win – it’s on my “to read” list. 2nd entry – I subscribed! Just tweeted your giveaway from twitter.com/lgllymarried ! And….I just subscribed to you via RSS (google reader). Hope I win!! This looks like an interesting read! Would love to win it. Would love to win! Looks like a great concept! I need to psych myself rich! Previous post: Should You Have Gold Fever?